Despite rumours to the contrary, Britain has not rejected the fast reactor concept as presented by GE Hitachi (PRISM). Talks will continue for at least 6 months, according to Nuclear Decommissioning Authority officials. Britain's large stockpile of nuclear waste includes more than 100 tonnes of plutonium and 35,000 tonnes of depleted uranium. The plutonium in particular presents a security risk as a potential target for terrorists and will cost billions to dispose of safely...The engineering firm GE Hitachi has submitted [a] ... proposal based on their Prism fast reactor, which could consume the plutonium as fuel while generating electricity. "It's a very elegant idea that we should try and use [the waste] as efficiently as possible. I definitely find it an attractive idea", said Prof David MacKay, Decc's chief scientific adviser. Recent news reports have suggested this proposal has been rejected by the government and Nuclear Decommissioning Authority (NDA) on the grounds of being too far from commercial viability. Current commercial nuclear reactors generate large amounts of so-called nuclear waste, which is actually extremely valuable nuclear fuel. Advanced generations of nuclear reactors will be able to burn this "waste" as an integral part of their fuel. Monbiot is a curious example of the growing number of leftist greens who have adopted advanced nuclear energy as a viable path forward for human civilisations. While still believing in the orthodoxy of carbon hysteria, such pro-nuclear greens have seemingly rejected the "dieoff.orgiasm" of their brother and sister greens. As for the integral fast reactor which Monbiot mentions, it is an idea that needs to be developed and put into commercial use as soon as safely possible. A well-planned and phased move from light water reactors to integral fast reactors, molten salt thorium reactors, and gas cooled reactors -- at all scales from the MW to the GW ranges -- would provide a safe and solid energy foundation under future societies and civilisations. “Some discussion about nuclear power is needed. Fourth generation nuclear power has the potential to provide safe base-load electric power with negligible CO2 emissions. There is about a million times more energy available in the nucleus, compared with the chemical energy of molecules exploited in fossil fuel burning. In today’s nuclear (fission) reactors, neutrons cause a nucleus to fission, releasing energy as well as additional neutrons that sustain the reaction. The additional neutrons are ‘born’ with a great deal of energy and are called ‘fast’ neutrons. Further reactions are more likely if these neutrons are slowed by collisions with non-absorbing materials, thus becoming ‘thermal’ or slow neutrons. There are two compelling alternatives to address these issues, both of which will be needed in the future. The first is to build reactors that keep the neutrons ‘fast’ during the fission reactions. These fast reactors can completely ‘burn’ the uranium. Moreover, they can burn existing long-lived nuclear waste, producing a small volume of waste with half-life of only decades, thus largely solving the long-term nuclear waste problem. The United States chose the LWR development path in the 1950s for civilian nuclear power because research and development had already been done by the Navy, and it thus presented the shortest time-to-market of reactor concepts then under consideration. Little emphasis was given to the issues of nuclear waste. Today the situation is very different. If nuclear energy is to be used widely to replace coal, in the United States and/or the developing world, issues of waste, safety, and proliferation become paramount. Both fast and thorium reactors were discussed at our November workshop. 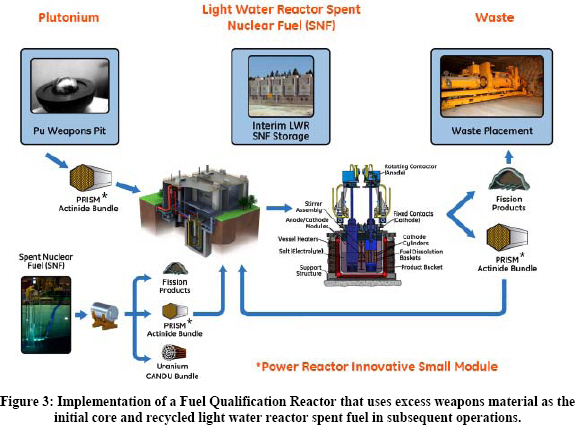 The Integral Fast Reactor (IFR) concept was developed at Argonne National Laboratory and it has been built and tested at the Idaho National Laboratory. IFRs keep neutrons ‘fast’ by using liquid sodium metal as a coolant instead of water. They also make fuel processing easier by using a metallic solid fuel form. IFRs can burn existing nuclear waste and surplus weapons-grade uranium and plutonium, making electrical power in the process. All fuel reprocessing is done within the reactor facility (hence the name ‘integral’) and many enhanced safety features are included and have been tested, such as the ability to shut down safely under even severe accident scenarios. The Obama campaign, properly in my opinion, opposed the Yucca Mountain nuclear repository. Indeed, there is a far more effective way to use the $25 billion collected from utilities over the past 40 years to deal with waste disposal. This fund should be used to develop fast reactors that consume nuclear waste, and thorium reactors to prevent the creation of new long-lived nuclear waste. By law the federal government must take responsibility for existing spent nuclear fuel, so inaction is not an option. Accelerated development of fast and thorium reactors will allow the US to fulfill its obligations to dispose of the nuclear waste, and open up a source of carbon-free energy that can last centuries, even millenia. It is commonly assumed that 4th generation nuclear power will not be ready before 2030. That is a safe assumption under ‘business-as-usual’. However, given high priority it is likely that it could be available sooner. It is specious to argue that R&D on 4th generation nuclear power does not deserve support because energy efficiency and renewable energies may be able to satisfy all United States electrical energy needs. Who stands ready to ensure that energy needs of China and India will be entirely met by efficiency and renewables? China and India have strong incentives to achieve pollution-free skies as well as avert dangerous climate change. The United States, even if efficiency and renewables can satisfy its energy needs (considered unlikely be many energy experts), needs to deal with its large piles of nuclear waste, which have lifetime exceeding 10,000 years. Development of the first large 4th generation nuclear plants may proceed most rapidly if carried out in China or India (or South Korea, which has a significant R&D program), with the full technical cooperation of the United States and/or Europe. Such cooperation would make it much easier to achieve agreements for reducing greenhouse gases. Prompt development of safe 4th generation nuclear power is needed to allow energy options for countries such as China and India, and for countries in the West in the event that energy efficiency and renewable energies cannot satisfy all energy requirements. Let's forge alliances and make movements where we can, Al Fin, all while remembering that science is an inherently skeptical enterprise ;).